The former NBA star has made several visits to North Korea to meet with leader Kim Jong Un and was a two-time contestant on Trump's "Celebrity Apprentice" show. He was fired twice on "Celebrity Apprentice," but Dennis Rodman apparently wants to show some goodwill toward President Donald Trump ahead of his historic Tuesday nuclear summit with North Korean leader Kim Jong Un. The former NBA star touched down in Singapore on Monday and signaled that the summit between Trump and Kim could open doors but he cautioned against anticipating much coming out of the first meeting. "Both of them will just see where this meeting is gonna go," said Rodman, one of the few people in the world who has a personal relationship with both world leaders. "So it should go fairly well. But people should not expect so much for the first time. Like I said, the doors are opening." Rodman later followed up in a tweet on Monday, saying, "Looking forward to @POTUS having incredible success that the whole world will benefit by." Rodman made a five-day trip to North Korea as a private citizen in June 2017 and met with Kim, whom he has called a friend, making him one of the few Americans to have visited the isolated country. He also visited the country in 2014, where he arranged a basketball game with other former NBA players and North Koreans and treated Kim with a rendition of "Happy Birthday." Rodman has been criticized for his visits because of the high tensions over North Korea's weapons programs. The former NBA star also was a contestant on Trump's "Celebrity Apprentice" television show in 2009 and its spin-off, "All-Star Celebrity Apprentice," in 2013. Rodman supported Trump during his 2016 presidential run. "I will be flying to Singapore for the historical Summit. 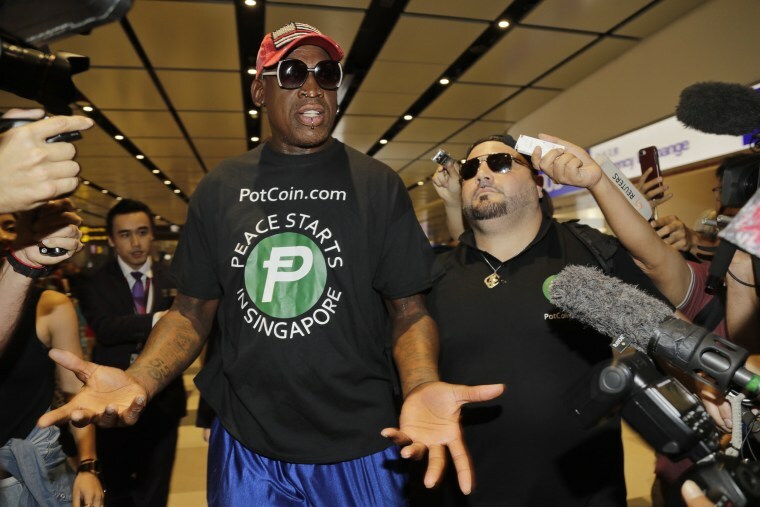 I'll give whatever support is needed to my friends, @realDonaldTrump and Marshall Kim Jong Un," Rodman tweeted on Friday, announcing that his trip would be sponsored by PotCoin, which describes itself as a "digital currency for the cannabis industry and community." Trump was asked last week if Rodman was invited to the North Korean summit and he said, "No, he wasn't," according to Reuters. Rodman also said on Monday he was not sure if he would meet with Kim while in Singapore. "It’s up in the air right now. I mean he has bigger things to worry about than seeing me right now," he told reporters.